At first glance, this image may look similar to those that appear beside ‘donate here’ instructions in magazine ads and non-governmental organization (NGO) websites. Then again, Kitza’s slightly pursed lips and resolute gaze might undermine such an association. Pride overrides victimization. This collaboratively created photograph is anything but cliché. For, it sit suspended within the intersecting webs of photographic meaning, norms, and desires caught up in both Congolese studio-like photography and humanitarian imagery that together define prominent aspects of the eastern Democratic Republic of the Congo’s (DRC) visual landscape. The eastern DRC hosts one of the world’s densest populations of humanitarian agencies and therefore an extraordinary density of humanitarian photography. Moreover, the region is home to a thriving local photographic industry, with the provincial capital of Goma sporting more than 1000 photographers. Created in Mugunga III, an internally displaced peoples camp in North Kivu, DRC, this photograph engages both local and humanitarian visual meaning. By examining the actions of the photographic production, this image helps to deepen understanding of the social politics of local engagements with humanitarianism within the region. My analysis engages the photograph with its inclusions and the visual excess (Poole 2005) as both a material object, and as a contact zone (Pratt 1991), where individuals grapple with distinctive power dynamics and strive in contrast and coordination with the photographer, to shape particular narratives. While created in a camp rife with international aid this humanitarian-looking photograph is at once a common aid representation, and a powerful local image conveying pride of employment and self. The humanitarian content does not efface the framed local narrative. For instance within Congolese studio photography, touch of objects, technology, and other people crafts stories of association. These inclusions and connections write the desired narrative that the photograph will carry forward to their anticipated viewers. By closing her hand around the scale, Kitza connects herself with the technology of her job. Unemployment is rife in the region, and the ability to visually ‘prove’ that one works is powerful; it is a strongly desired local photographic trope. Moreover, her placement, showing the logos of various humanitarian agencies in the background intentionally connects her work to the powerful network and economy of aid. The phantom hand that tilts the scale towards the camera belongs to the child’s mother, who with Kitza helped to choreograph the image’s creation and to ensure the clarity of the forthcoming visual narrative. Yet, the poignancy of touch and narrative is not limited to the scale. For, in her right hand, Kitza also holds her cell phone –a non-accidental photographic inclusion that connects Kitza to realities outside of regional hardship: modernity, globalization, and consumerism. 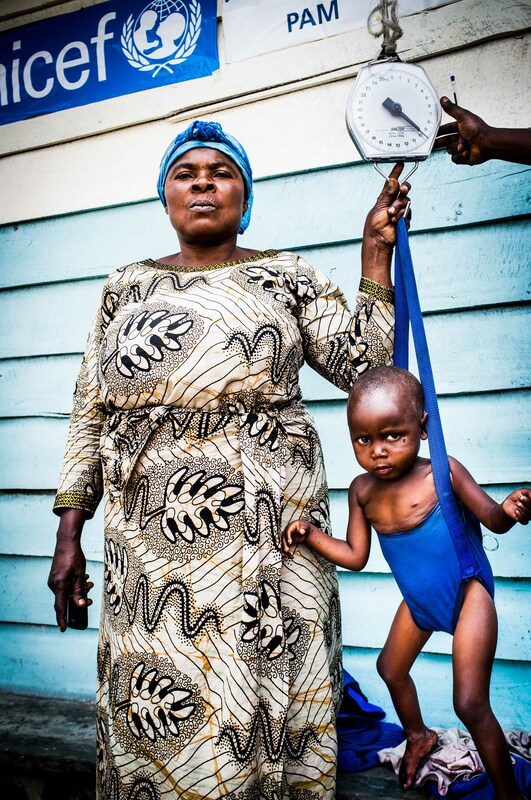 The eastern DRC suffers from more than 20 years of war, displacement, and disease. Yet hidden just below the surface of images that reflect this history are local narratives that speak to the agency and pride of the population. In contrast to Sontag’s (1977; 2003) claims of the ‘predatory’ camera and re-victimized subject, this image of Kitza shows how photographic subjects can and do step beyond passivity. Kitza was determined in what she wished to be included in this photograph and how it was to be represented. She retied her headscarf, smoothed the front of her dress, and then choreographed the inclusion of the scale, the logos in the background, the uncluttered space behind her, and the child in the sling. Ultimately, Kitza knew I would give her a print of this image, and took great care to ensure that this humanitarian themed photograph also carried locally salient narratives that she could personally cherish. With their faces mostly hidden, these women still reveal much. 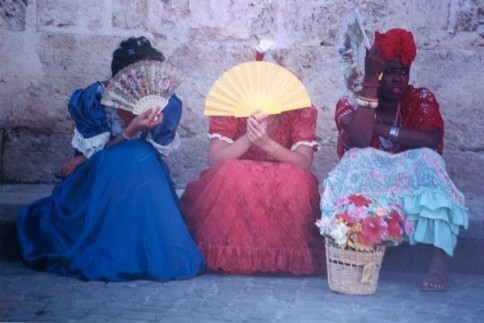 The three dames in elaborate dress sit on a low bench against an aging stone façade – perhaps a church or cathedral - somewhere in Cuba. Fans mostly obscure their faces and long dresses and a basket of flowers remove five of the six feet from view. Like a carefully constructed studio photograph, the image shows them as sumptuously adorned and associated with the beauty of the equally colorful flowers in the basket. Bangles, fans, rings, lace, headscarves, ruffles and yards of bright fabric decorate their bodies and add to the compelling appeal of the image. They appear to be dressed for a special occasion – to perform a dance, to attend a special service, or celebrate a particular festival or holiday. Such a photograph seems to draw from a rich history of social science photography as a means to document material culture. Photographs are powerful not only for their ability to be used as ‘evidence’ (Tagg 1988), but also for their inherent ambiguity (Berger 1973). Each photograph will raise more questions than it answers. Here, due to the minimal context included, it is hard to see much beyond the well-framed portrait. One can see that women sit, well dressed, on the bench. Two of the fan ladies cover their faces, potentially avoiding a photograph that can identify them. This raises questions about the power dynamics and expectations of appearance in relation to notions of gender, class, and race within Cuba. Moreover, it also raises questions about the power dynamics between the seated women and Rachel, as a foreign female photographer. Answers to these questions lie in the unpacking of the situation in which the photograph was created. Was this a rural or urban space? Was the photograph created because these women represented a part of Cuba Rachel regularly interacted with? Or perhaps this photo, like her photographs of the Massai in Africa, potentially speaks to the beauty of tradition, which is made ever more visible by its contemporary rarity. Additionally, I’m curious about what the women’s body positions say about Rachel’s interaction with them. Did she ask for their permission to take this photograph? Is it fear, irritation, or modesty that causes them to cover their faces. Nonetheless, there is agency in this photograph, showing a physical communication between Rachel and the women. The women respond to her as a photographer. But do they also respond to her as a young American woman? Would this photo have been different if created by a man or by another Cuban citizen? Moreover, I suspect that Rachel may not be the only photographer involved in the broader scene. For, the woman on the right gazes to her left with a difficult to pinpoint emotion – is she irritated? Tired? Hot? Simply resting? The woman in the blue dress also points her fan and her face towards that same direction, potentially indicating engagement with additional photographers, while the yellow-fan-holding woman seems to address Rachel directly. As such, if there were more than one photographer, it suggests that the opportunity to photograph these beautifully decorated women was unique and perhaps fleeting. Ultimately though, the pretty composition of such a portrait leaves the viewer with more questions than answers. It also creates a compelling photograph through which to spin myriad hypotheses, the reality of which only Rachel and the three fan women would be able to confirm. With their faces mostly hidden, these women still reveal much. The three dames in elaborate dress sit on a low bench against an aging stone façade – perhaps a church or cathedral - somewhere in Cuba. Fans mostly obscure their faces and long dresses and a basket of flowers remove five of the six feet from view. Like a carefully constructed studio photograph, the image shows them as sumptuously adorned and associated with the beauty of the equally colorful flowers in the basket. Bangles, fans, rings, lace, headscarves, ruffles and yards of bright fabric decorate their bodies and add to the compelling appeal of the image. They appear to be dressed for a special occasion – to perform a dance, to attend a special service, or celebrate a particular festival or holiday. Such a photograph seems to draw from a rich history of social science photography as a means to document material culture. Photographs are powerful not only for their ability to be used as ‘evidence’ (Tagg 1988), but also for their inherent ambiguity (Berger 1973). Each photograph will raise more questions than it answers. Here, due to the minimal context included, it is hard to see much beyond the well-framed portrait. One can see that women sit, well dressed, on the bench. Two of the fan ladies cover their faces, potentially avoiding a photograph that can identify them. This raises questions about the power dynamics and expectations of appearance in relation to notions of gender, class, and race within Cuba. Moreover, it also raises questions about the power dynamics between the seated women and Rachel, as a foreign female photographer. Answers to these questions lie in the unpacking of the situation in which the photograph was created. Was this a rural or urban space? Was the photograph created because these women represented a part of Cuba Rachel regularly interacted with? Or perhaps this photo, like her photographs of the Massai in Africa, potentially speaks to the beauty of tradition, which is made ever more visible by its contemporary rarity. Additionally, I’m curious about what the women’s body positions say about Rachel’s interaction with them. Did she ask for their permission to take this photograph? Is it fear, irritation, or modesty that causes them to cover their faces. Nonetheless, there is agency in this photograph, showing a physical communication between Rachel and the women. The women respond to her as a photographer. But do they also respond to her as a young American woman? Would this photo have been different if created by a man or by another Cuban citizen? Moreover, I suspect that Rachel may not be the only photographer involved in the broader scene. For, the woman on the right gazes to her left with a difficult to pinpoint emotion – is she irritated? Tired? Hot? Simply resting? The woman in the blue dress also points her fan and her face towards that same direction, potentially indicating engagement with additional photographers, while the yellow-fan-holding woman seems to address Rachel directly. As such, if there were more than one photographer, it suggests that the opportunity to photograph these beautifully decorated women was unique and perhaps fleeting. Ultimately though, the pretty composition of such a portrait leaves the viewer with more questions than answers. It also creates a compelling photograph through which to spin myriad hypotheses, the reality of which only Rachel and the three fan women would be able to confirm.